The days of dull, grey and monotonous-looking concrete are long gone. Today, homeowners are using decorative concrete to build their patios, floors, decks and driveways. Right from budget homes to luxurious homes, there is nothing more impressive than seeing a stunning concrete surface. Using concrete for decorating has turned into a hot, new trend that is transforming residential and commercial structures across Hawaii. Traditional concrete has always been grey in color and this gives it a dull and simple appearance. 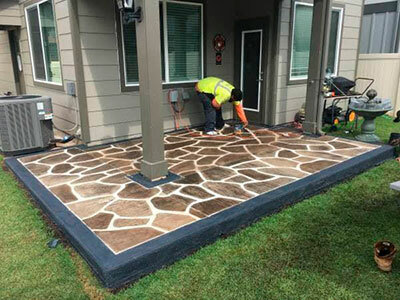 However, when you use the services of Unlimited Landscape Hawaii LLC, we can transform the appearance of concrete into warm and inviting colors that can give your concrete flooring an expensive and decorative look and feel. Whether you are looking for a Spanish look for your pool deck or an outdoor kitchen countertop that is resistant to the rigors of the weather; you can use decorative concrete to come up with an amazing and impressive structure that can leave you and others spellbound by its beauty. Truly, the warmth that the concrete used for decoration exudes is inviting and unique and with the advancements in concrete stains and dyes, you can now enjoy colors to suit your home décor. The huge range of textures and patterns allows you to customize the look and feel not just of the interiors, but also the exteriors of your home. Today, decorative concrete has become one of the most durable, versatile and sought-after materials in the market. The attraction also extends to the cost, as it is a cost-effective construction material. In Hawaii, be it Mililani, Hawaii Kai or Pearl City, the rays of the sun are a fact. This can heat up the surfaces outdoors, making them hot. When you use decorative concrete to build your patio, deck, driveways or entryways, you will notice a difference, as it has the ability to reduce heat island effect. This occurs due to improved solar-reflecting abilities of the surface, making the surface less hot than what it would have been otherwise. 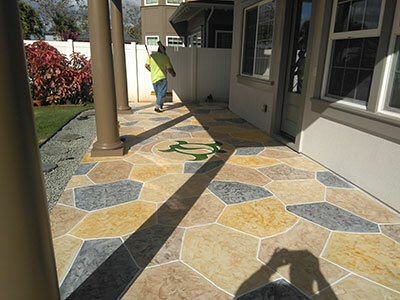 Decorative concrete requires skill, expertise and knowledge and we at Unlimited Landscape Hawaii LLC has those in plenty. You can rely on us to offer you superior quality work with exceptional customer service. Call us today on 808-726-9495 and speak to our courteous and efficient staff. They will be able to answer your queries or help you get an estimate for the work. We are located in Wahiawa, Hawaii, but service several areas, including Kaneohe, Ewa Beach and Kapolei amongst others.